Professional teeth cleanings are essential to dental health and should be carried out regularly – it is not to be neglected. Dentists recommend to get a teeth cleaning treatment once or twice a year to avoid gum problems and accumulation of plaque. For utmost dental care, patients should follow good oral care practices at home. The daily routine of properly brushing and flossing of teeth are advised. This is because good dental home care can help to control the rate at which bacteria in the mouth is able to multiply, which then decreases the chances of developing gum disease. If gum disease develops because of neglected oral care, this can cause serious damage to teeth and gums. Teeth cleaning at home is an important part of dental hygiene; however, on its own it is not enough to completely prevent the development of gum disease. For this, contact your trusted La Grange dentist to make an appointment for a professional teeth cleaning. Cleaning your teeth at home by effective brushing removes a large amount of plaque from the surface of the teeth. Yet, it is this very plaque which, if left behind for a relatively short time, will eventually solidify to form tartar. This tartar is very damaging to the state of teeth and gums in your mouth. 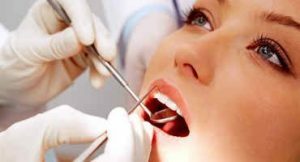 Before beginning a professional teeth cleaning, your La Grange dentist will first evaluate the amount of accumulated tartar as well as the state of tooth decay in a your mouth. Solid tartar that builds up between teeth and just below the gum line can cause significant tooth decay. If this is not removed, the bacteria in the tartar will begin to break down gums and start creating pockets. This is the onset of periodontal disease or gum disease which causes gum bleeding and bad breath, and possibly even tooth loss. During the professional teeth cleaning process, your dentist will work in each of the four quadrants of the mouth. With effective dental hygiene tools, the solid pieces of tartar will be removed one piece at a time. These are removed from the spaces between neighboring teeth and in the area just below the gum line. This process is called scaling and can be uncomfortable, especially in cases where patients are suffering from severe gum disease. In most cases, scaling together with persistent dental home care can reverse gum damage. Affected gums will be treated in order to help them heal and support the teeth in the mouth.